Winner of Don Grant Award, 2016. This is a book partly about memories, and about omissions from the historic record. It's a book partly about the 'squeaky wheel' principle, the cult of celebrity and the disregard of science. It's a book partly about the power of perseverance and the notion of duty. It's a book partly about becoming an Australian. It's a book largely about the illusion of a spinster's life having little meaning as the Victorian era merged into the turmoil of the first half of the twentieth century. At its core, it's the story of a very interesting woman and the family surrounding her. The artist Margaret Lilian Flockton was born in England in 1861. Arriving in Australia in 1888, she worked first as a skilled lithographer and in the 1890s achieved recognition in Sydney's 'fine art' world. At the age of 40 she finally found her dream job, with an ideal boss (Joseph Maiden). She became well-known amongst the scientific community of her day, but after her death in Sydney in 1953 she was then largely forgotten for half a century. She was rediscovered by two botanical artists at Sydney's Royal Botanic Garden, Catherine Wardrop & Lesley Elkan, who championed her cause at an International Women's Day lunch in 2003. Their speech led to the establishment in 2004 of an award for scientific botanical illustration, honouring Margaret. Within a couple of years, the Margaret Flockton award became something of a phenomenon, attracting entries from around the world. Margaret herself remained a shadowy figure. Coincidentally, around the same time as that speech in 2003, research had begun into the fascinating life of the esteemed woman known to all her family as 'Aunt Mog'. Speech makers and event organisers were completely unaware in 2003-2004 that Margaret Flockton had any living relatives and that this book was already underway. It's been a long time coming, but a beautiful book has emerged. Experienced biographer Louise Wilson has catalogued, chronologed and celebrated the life of a reclusive and overlooked Australian. From fragments of her life, Louise has been able to paint an engaging portrait of a woman ahead of her times and someone of great ability and humility. Prof Tim Entwisle, Director of the Royal Botanic Gardens, Melbourne. The book was launched by Prof the Hon Dame Marie Bashir AD CVO at the Maiden Theatre, Royal Botanic Garden in Sydney at 4pm on 17 November 2016. She said 'this beautiful book is a gift to Australia'. Winner of AIGS Don Grant Award 2016 for a biography with a family history focus. 'The judges were enchanted with this lovely book, describing it as an excellent biography, with impeccable research and beautifully written, and also beautifully illustrated and designed'. 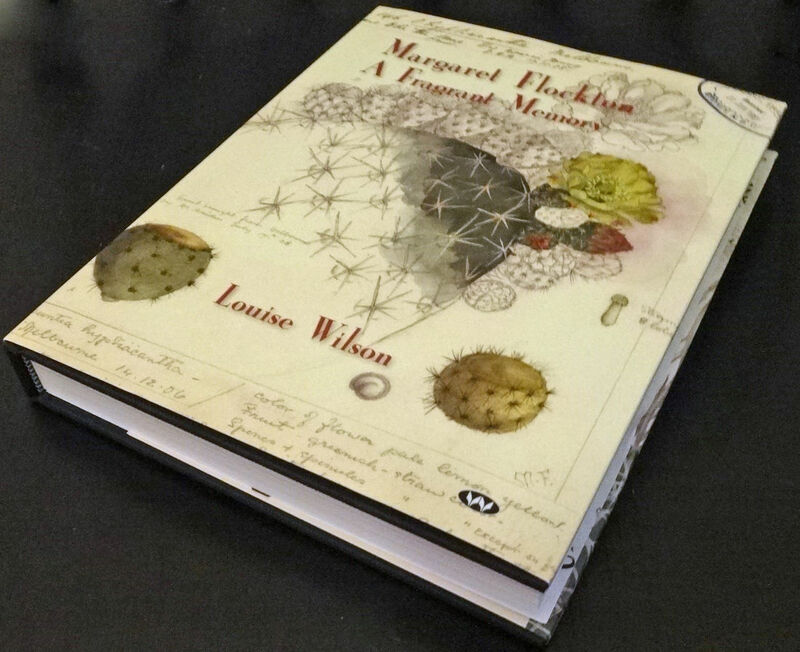 In October 2012 Louise Wilson gave an illustrated talk about Margaret Flockton's life as part of the highly successful Capturing Flora exhibition at the Ballarat Art Gallery. In 2013 the Capturing Flora exhibition showed at the S H Ervin Gallery in Sydney from 15 February to 17 March. The Margaret Flockton talk was repeated at the Royal Botanic Garden in Sydney on Monday, 15 April 2013 and again on Thursday 15 August, 2013. Bombala Garden Club members were introduced to Margaret on 16 July 2016. A talk on Margaret Flockton was given at North Sydney's Stanton Library on 8 September 2016 as part of NSW's History Week. Radio interview with Angie Rehe on Melbourne's Triple R on 19 January 2017. Listen via this link - http://ondemand.rrr.org.au/player/128/201701190900 Drag the cursor along the timeline to 2 hrs 17mins 32 secs to reach the start of the interview. Radio interview with Ann Creber on 3MDR's 'The Good Life' on 13 February 2017. Listen via this link - http://www.3mdr.com/programs.html?the-good-life/2017-02-13. Warning, it's a long interview and it starts 10 minutes in! A talk on Margaret Flockton at the Randwick & District Historical Society on 17 June 2017. Not applicable - this book is available through the usual retail channels. OR - ask your local library to order a copy.